' I will gladly do that,' said the cattle-driver ; and he opened the sack, and Little Klaus struggled out at once.
' You will take care of the cattle, won't you ? ' 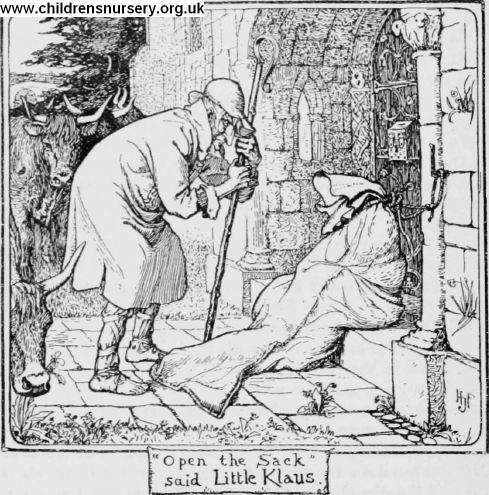 asked the old man, creeping into the sack, which Little Klaus fastened up and then went on with the cows and oxen. Soon after Big Klaus came out of the church, and taking up the sack on his shoulders it seemed to him as if it had become lighter; for the old cattle-driver was not half as heavy as Little Klaus.